Well I’ve been back from holidays for a while now. But Japan was such a blast. It’s a great place for all ages, I highly recommend it for big kids and families with little kids. There is quite a lot to see in all sorts of interests. If you do a bit of research before you go, you can map out an itinerary that suits you. For Ced and I it was glass (for me) and robots and figurines for him (and a little for me :-)) and we’ve come away well rewarded. So this post and the following ones are about what glass stuff I found in Japan. I would definitely go back to Japan and keep exploring their glass places as I know there is so much I missed. I highly recommend Google Maps to help you find these places and Google Translate to translate the Japanese websites! I’ve split these posts up as it was too long as one post. Hopefully it makes it easier for people using it as a guide. First up, Tokyo. All I had for Tokyo was an address to a shop called Kinari in Asakusabashi suburb. Translating this page and then finding it on the Tokyo JR (Japan Rail) map was easy. I used Google Maps to get a bigger map and compared it to the one on the website. It’s only a short walk from the station passing a few interesting shops along the way. The first floor of the Kinari Asakusabashi is beads and findings for sale. These beads are made by Japanese artists. 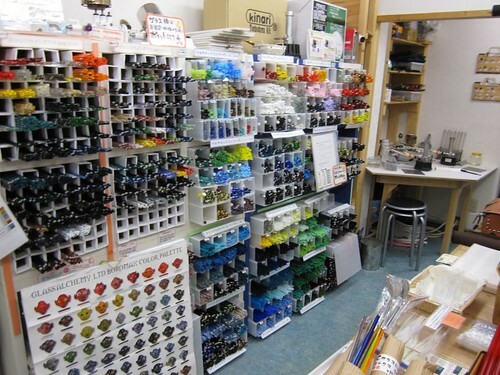 The second floor is where I spent most of my time – lampwork books, magazines, tools and glass rods are all here. The third floor is their workshop for classes and the fourth floor is big equipment sales (I think) – I didn’t make it up to the 2 top floors. I bought some different shaped mandrels – rectangular, half-moon and a flattened blow tube – and a lot of Japanese glass magazines and books. They also stocked Glass Alchemy boroscillicate glass rods, an American glass brand, and their own glass that they make called Kinari glass. This is a soft Japanese glass which I would think is similar to Satake. They have a lead series and a lead-free series. There were some really beautiful shades of colours but I didn’t buy any. Too heavy and I already had bought tonnes of mags and books! I’m sure there’s a lot more glass stuff in Tokyo but I hadn’t done a lot of research by this stage. I wish I found this website on Japanese glass artists, galleries and museums a lot earlier! If you know of any other glass places in Japan, please put in a comment and I’ll add it to the post. Hopefully this will be a useful resource for glass bead makers who are wanting to travel to Japan. Well, I am taking a borosilicate class in this Shop (fourth floor), my teacher is Yoshio Omura, he is a grear artist, his works are in TonboDama 2 book, he speak english. In the third floor is for TonboDama class, there are a person who speak english and teach to make a TonboDama…..ah kinari is not similar to satake glass, its COE is more than satake, dont mix..
Hello, I use kinari glass but haven’t been able to buy it lately, I really need to buy more. Do you have an email address or contact to order??. I am desperate because I am running out. I don’t use Kinari glass so I’m not sure where you’d buy it other than from Japan. You didn’t say what country you’re from, so I’ll assume you bought your last lot of glass from Japan. Hello Avril, I live in the USA. My friend Morio has been bringing large quantities back for me from time to time but I haven’t been able to get a hold of him and I may have to travel there to buy if I cant get Kinari to respond. Seems like a lot of trouble but don’t know what else to do?? Do you know where the main factory is? thanks for your time, I may have to start planning a trip. Hello I was trying to send you a photo of my latest glass collection of the Retro Sci-Fi toy line since it seemed so similar to your Japanese trip. I cant seem to upload a photo. I will look on facebook. Sorry again, I don’t know where Kinari is manufactured. Why not order through their website? Thanks for the photos on FB, very cool guns. A trip to Japan is highly recommended! !